Throughout the month of June, the City of West Hollywood will emblazon two crosswalks along Santa Monica Boulevard and San Vicente Boulevard with the colors of the LGBT rainbow flag in celebration of PRIDE Month. As a symbol of PRIDE and as a symbol of LGBT rights, the brick pattern area within the crosswalks has been painted with the colors of the rainbow flag. “In a world when we are continually reminded, through heart-wrenching teen suicides and public hangings in the Middle East, that being gay is wrong. It gladdens my soul and lifts my spirits to know that the City of West Hollywood embraces its LGBT community so publically, so boldly,” said West Hollywood Mayor Jeffrey Prang. “By painting the crosswalks in rainbow colors on one of the most famous thoroughfares in the country, Route 66, the City of West Hollywood is declaring to the world that we are a City of tolerance and acceptance for all, no matter how you define yourself. Be proud of who you are, we are!” continued Mayor Prang. This intersection, in the heart of one of the most iconic areas for the LGBT community, serves as the entrance to the Christopher Street West Annual LA PRIDE Festival. 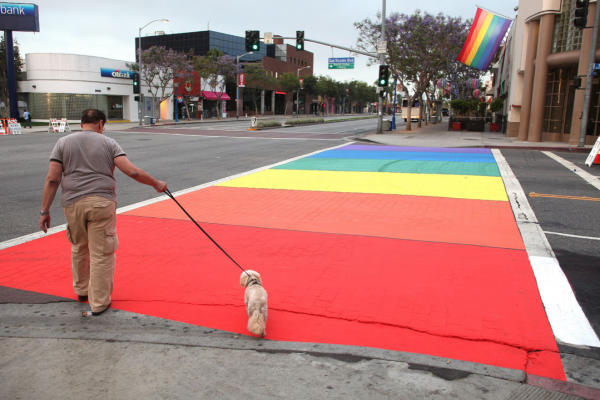 The painting of rainbow crosswalks serves as a creative and unique gateway to PRIDE activities in West Hollywood. Find the City of West Hollywood on Facebook and follow @wehocity on Twitter and Instagram. Use the hashtag #wehopride and show the world how West Hollywood celebrates Pride! For more information, please contact the Office of West Hollywood Mayor Jeffrey Prang, at (323) 848-6460.